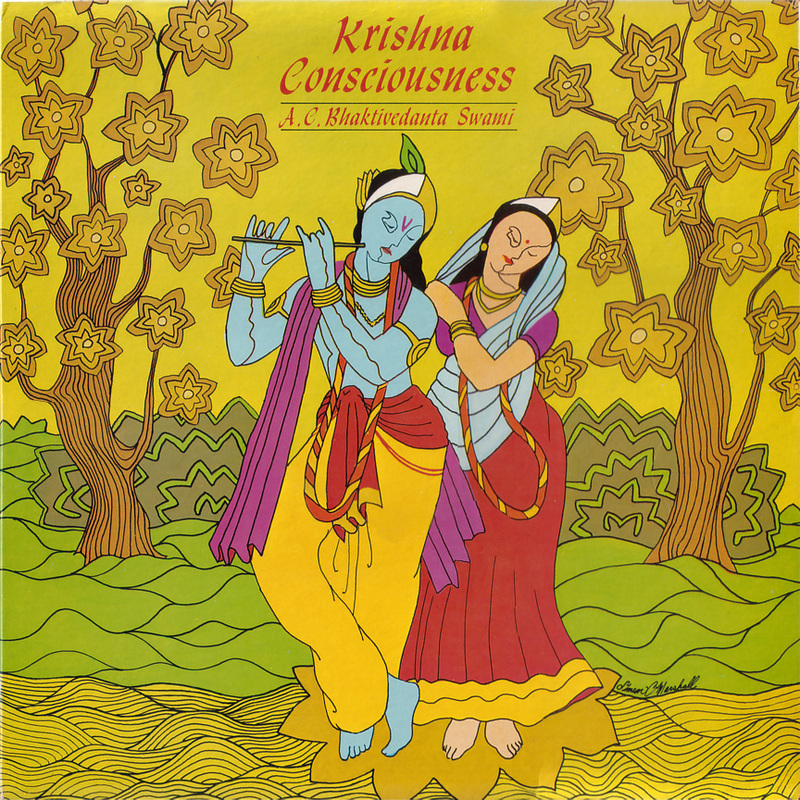 This is the first Hare Krishna record album, produced in 1966 by Alan Kallman in New York. 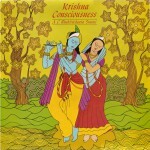 Satsvarupa das Gosvami has written about it: First Hare Krsna Albums. 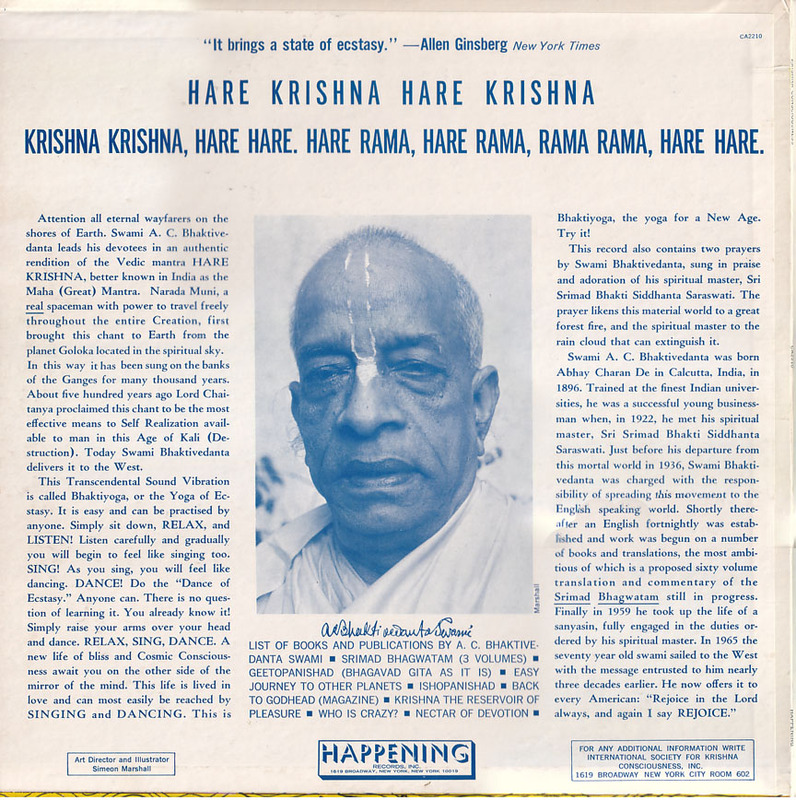 Mr. Kallman, a record producer, and his wife came to see Prabhupada at 26 Second Avenue one evening in 1966, and inspired by the joyous kirtan, suggested that Prabhupada and the devotees make a record. Mr. Kallman returned to meet with Prabhupada and talk over the terms. When the day arrived, Prabhupada and the devotees led a boisterous chanting party around Times Square, on their way to the recording studio there, with Hayagriva playing bass drum and others playing karatals. Once inside the studio, they practiced with the sound engineer for about fifteen minutes, and then the record was cut on the first take. Prabhupada played a wooden khol, others played karatals or sticks (the sound engineer reduced the number of karatals). The Hare Krishna mantra on the first side lasted about 12 minutes. 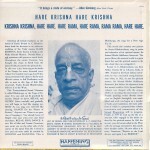 Then the second side was recorded with Prabhupada singing the Samsara prayers, accompanied by Kirtanananda on harmonium. Prabhupada also spoke the purport of the mantra. An artist at Happening Records came up with the album art. It is said that Prabhupada very much liked the photo of himself on the back of the album sleeve, that he approved of its solemn disposition. Production was delayed, but when it did come out, the record sold out quickly. Apparently the Beatles also got hold of a copy of the record and liked it. 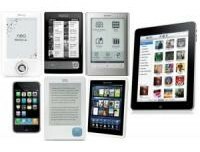 This entry was posted in Audio, Early Hare Krishna movement, Srila Prabhupada and tagged Alan Kallman, Happening album, Happening Records, Hare Krishna records, Prabhupada recordings. Bookmark the permalink.